slowly but surely getting a hang of this outdoor running thing. Happy Easter Eve! I was so happy to have yesterday off and even happier to get so much done this weekend. I think we all need at least one extra day off each month to catch up on life things. Getting that time to recharge is something we all deserve. Friday was a rest day for me, so I had all of the time to do errands and focus on me which was wonderful. I took some time to go shopping at my all time favorite places (*cough* Costco & Target*cough*) and also had a chance to hit up Marshall’s where I got three sports bras for a combined total of under $30. Yep. I know what you’re thinking, I won the day. When I got home, as is the usual for me on rest days, I was feeling pretty antsy. I decided to put on some Tone It Up yoga sessions that I saw on YouTube. Their style of yoga was much more fitting to what I like. Really quick paced and more of a workout/yoga hybrid. This of course got me jazzed and I unintentionally created a circuit for myself to complete while I was watching TV. I set the timer on my phone to 10 minutes and told myself I had to fill it with whatever exercises I wanted to, but I couldn’t stop until the timer went off. 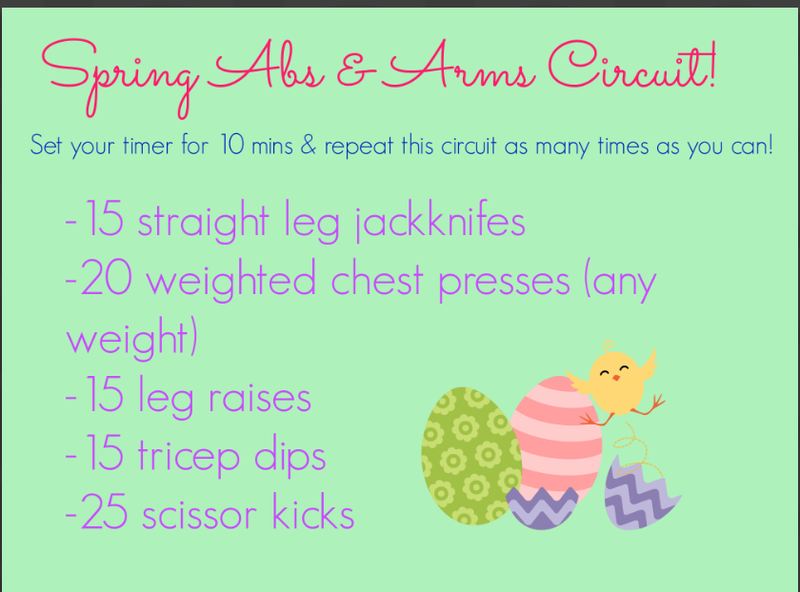 Enter the Spring Abs & Arms Circuit! For a real burn, I would suggest completing the ten minute circuit 3 times, but if you want to do it just once, you’ll definitely feel it. After unintentionally working up a bit of a sweat on my rest day, I threw in the towel and vowed to take it easy for the rest of the day. This morning was a different story. I’m really trying to get a hang of this outdoor running thing and am making it my goal this April to take more of my runs outside. I usually start with a mile warm-up with my pup (who loves to screw with my times because of bathroom breaks, that rookie) and then do a 2 mile out and back run to a destination near my house. Not a terrible time over all and better than the other day which was a huge surprise to me since it was exhaustingly windy outside this morning. I felt like I was running against a brick wall, but no pain no gain and all that. I headed to the gym a bit later and knocked out 2.5 more miles and some elliptical cooldown before calling it an absolute day and avoiding using my legs for the rest of time. Until tomorrow that is. I have chosen to do Week 8 Legs and Cardio tomorrow instead of on Thursday since in Week 6, having leg day as the last day DID NOT agree with me. I was actually on the verge of death and my legs were not cooperating because I had just run way too much on them that week. You live and you learn and you replan your week 8. Hope yall have the best Easter possible. I’m hoping to celebrate pending my leg circuit doesn’t kill me. < Previous another one bites the dust. Next > motivation monday: strive for progress, not perfection.